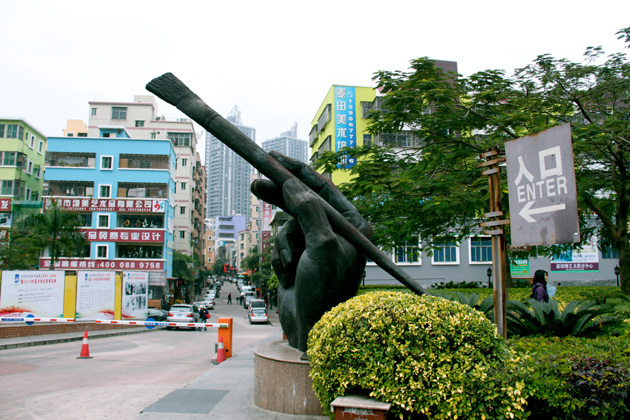 Chalk and Raddy explored Da Fen Oil Painting Village (ShenZhen) to find a whole new world of art. Originality bred amongst duplication; does practice make a great artwork? Artists – usually seen as people with that talent and knack for creativity, originality and intrinsic values that cannot be replicated, are produced by the masses in Da Fen. Most start out as apprentices duplicating works and are commissioned to be “copy artists”. Few go on to break their mold and venture into the altruistic traits of an “Artist”. What is important to realise is that reproduction is not just copying. It is also about skill, precision and the will to learn. It is also a way of life for most of the artists (or painters?). So… are these reproductions considered counterfeit? To be fair, most are produced without the original artist’s signature, so there is no claim that the reproduction artist composed the work. And although it iss highly similar, it is still not the same. As the Thais would say, “same same, but different…”! Thousands of Van Gogh’s self portrait has been reproduced and sold, in addition to Yue Min Jun’s laughing man, and even Édouard Manet’s A Bar at the Folies-Bergère. Bring a picture of your favourite painting or designs, and it will be reproduced for you, to the highest quality. Things however has changed in Da Fen. The same artist described Da Fen in 1990s/2000s as much more vibrant and thriving, with more buyers and artists. Prices were also much cheaper then, whether rental or food, and hence art pieces. The award of “City of Design” by UNESCO to Shenzen, and government involvement in the DaFen Oil Painting Village has driven prices upwards, thus driving away customers and artists. Gallery owners will also tell you that the market used to be dominated by western tourists; but this is now changing as they find that most of their clients are now local (all over China) art enthusiasts. ArtRadarJournal has written extensively about this intriguing village and business.See articles: Dafen Art Village Part 1 and Dafen Art Village Part 2. Posted on August 13, 2012 by ChalkandRaddyPosted in Visual ArtTagged Da Fen, Dafen Oil Paintig Village, Shenzen art village. Glad you liked our articles, and thanks for the link!